Yup, you read that right. I did not go to Korean class this Saturday. This Saturday was the last class of Level 1, the 8-week course I started during week 5. The plan for class today was to spend one hour reviewing, and one hour taking a test in order to move up to level 2. My Hangul class TTG friends and I are going to take the level 1 class again (but this time starting with the first class instead of the fifth) when it starts over next week. Hence, there was no reason to subject ourselves to the pains of an impossible Korean test far above our levels. 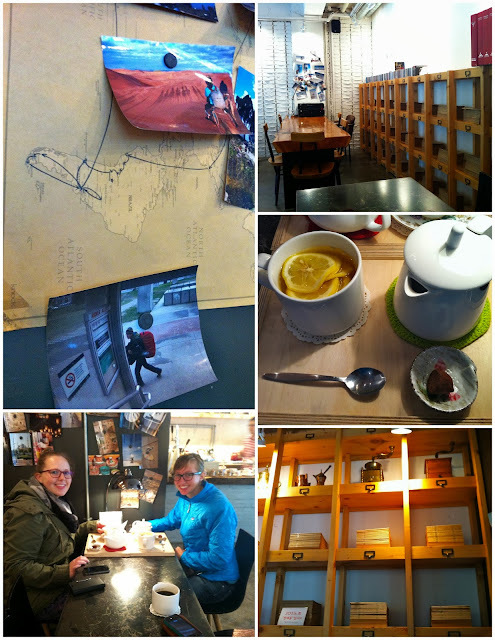 We had also decided to book a hostel in Seoul this weekend, to get more out of our trip into the city. The last time I had stayed over in Seoul was during Chuseok. Unfortunately like last time, I also was at the beginning stages of a cold when I woke up on Saturday. I tried to get some more sleep that morning, but with no luck. So I didn't get to Seoul until later that afternoon. I checked into the hostel, then met up with Lauren and Anne who were in Itaewon at the same Guinness bar we'd been to over a month earlier. This time, it was decorated for Halloween. After a drink there, we met up with some others for a little shopping and sushi dinner to celebrate a TTG's birthday! I'm not a raw-fish person, but I really liked the restaurant we ended up in. Food came by on a conveyer belt, so you grabbed what you wanted and paid based on the color and number of plates you had at the end. 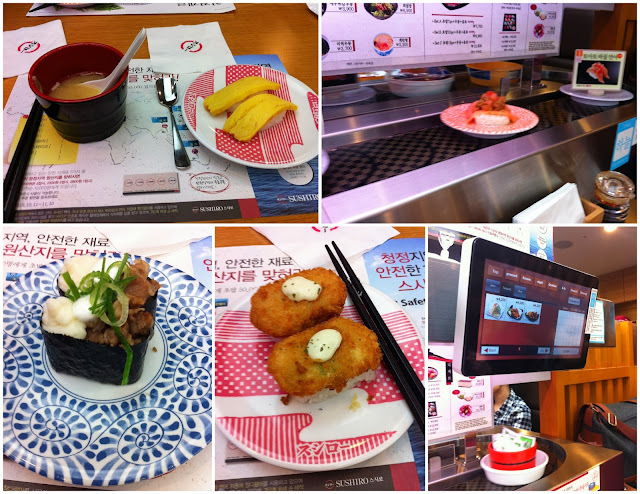 Each table also had a touch-screen (in English too!) for ordering any menu items. We put in an order, and in only a minute or two, there it was coming towards us on the conveyor belt! On Sunday morning, three of us had some tea and breakfast in the cutest café below our hostel. I like the atmosphere of the place. The walls have pictures of a couple (I'm assuming they're the owners) in all sorts of countries. There's a big world map on one of the walls, drawn on with sharpie to mark their travels. My honey and lemon tea was delightful, as was the chocolate that came with it. My cold was taking over my body, so I didn't feel the greatest when we left. Rather than do anything else in Seoul, I headed for my bus stop to return home. I got in a little nap, did laundry, and all sorts of other good Sunday afternoon activities.